Life's a Beach | Expat Life in Playa del Carmen : Riviera Maya Trip Report Contest!! In The Roo Travel Guide, Buy Playa Real Estate Advisors and Wicky's are joining forces to sponsor a Trip Report Competition each month through the end of 2010. The best trip report submitted each month will win $100 USD in cash, while runners up will win $50 USD in cash or a $25 Gift certificate for Wicky's Restaurant and Beach Club. 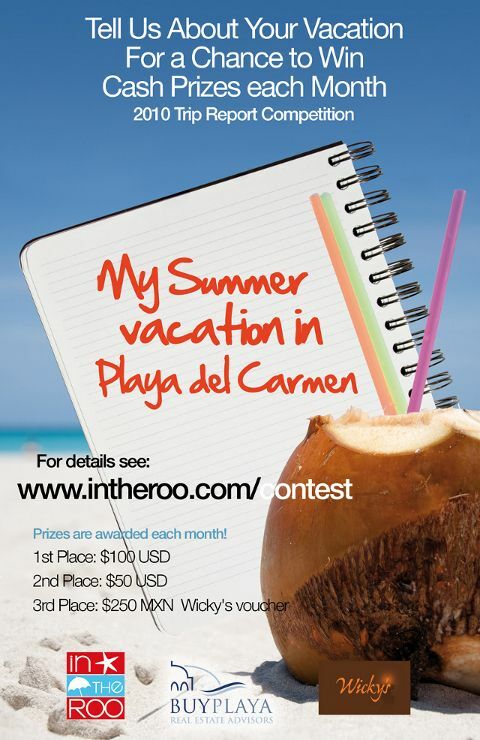 To be eligible, entries must be posted on the Trip Reports section of the InTheRoo.com forum. Travel must have been completed in 2010, and include destinations within the state of Quintana Roo, Mexico. Eligible travel locations include the popular travel destinations of Cancun, Isla Mujeres, the Riviera Maya, Playa del Carmen, and the Costa Maya. The trip report contest will run through December 31, 2010 with prizes being awarded monthly for the best submissions. Trip reports are evaluated by an impartial judging panel, consisting of residents and seasoned travelers of the state of Quintana Roo. Visit InTheRoo.com for complete details. # re: Riviera Maya Trip Report Contest!! I will pitch in another $ 50 bucks off all reservations made on my website. Just mention buyplaya.com and stay in our luxury resorts in Cancun and Playa del Carmen.